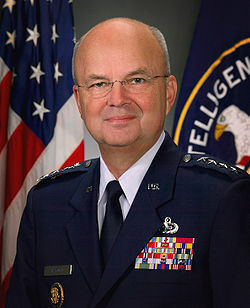 April 19, 2011 (Raleigh, NC) — General Michael Hayden — the only person to serve as director of the National Security Agency (NSA) and as director of the Central Intelligence Agency (CIA) — is the keynote speaker for the 7th Raleigh Spy Conference August 24-26, 2011. Hayden, at one time the highest-ranking military intelligence officer in the United States, oversaw NSA’s surveillance of technical communications between foreign and domestic terrorist groups during his tenure from 1999 to 2005, the longest stint of any previous director. While CIA Director from 2006 to 2009, he defended intense interrogation of terrorist suspects. For the 2011 Raleigh Spy Conference, General Hayden will join speakers Michael Sulick, former director of CIA’s National Clandestine Service – and now a Raleigh-area resident; retired CIA officer Brian Kelley, the “wrong man” in the investigation of FBI traitor Robert Hanssen; British author and intelligence expert Nigel West; and retired Royal Canadian Mounted Police intelligence officer Dan Mulvenna. Douglas Waller, author of the best-selling biography Wild Bill Donovan about the founder of the Office of Strategic Services – the World War 11 forerunner of the CIA — will anchor an Authors Roundtable during the conference. Other authors for the Roundtable will be announced later. New to the conference this year: The Historical Collections Division of the Office of Information Services of the Central Intelligence Agency has selected the Raleigh Spy Conference to provide published works of recently declassified secret documents, ranging from the Korean War, the Warsaw Pact, Air America, martial law in Poland, the Soviet invasion of Czechoslovakia, and the papers of controversial CIA director Richard Helms. Officials from CIA’s Historical Division will be on hand in Raleigh to discuss their work and answer individual questions. Magazine publisher Bernie Reeves founded the Raleigh Spy Conference in 2003 to provide a forum for intelligence experts to interpret for the general public the high volume of declassified information available since the collapse of the Soviet Union. Raleigh Metro Magazine will host the 2011 Raleigh Spy Conference at the North Carolina Museum of History in downtown Raleigh. The cost for attending the conference is $250 per person. Special discounts are available for veterans, members of the military and intelligence community ($175). Seniors over 62, teachers and students may attend for $145. The Association of Former Intelligence Officers (AFIO) recognizes the Raleigh Spy Conference as the top intelligence conference specifically for the lay public in the United States. Three of the six conferences have been filmed and aired on C-SPAN. For more details on the history of the conference, go to www.raleighspyconference.com/about/.